Feb 28. 2018 In December 2017, New Horizons trained its digital eyes towards its final destination to take the first photos of the Kuiper Belt. What resulted was both a record breaking moment for space travel and a discovery that could prove ground-breaking in our understanding of the solar system. Launched by NASA in 2006, New Horizons is an interplanetary spacecraft whose primary mission was to reach Pluto and to study the Kuiper Belt. New Horizons took several images from a distance of 6.12 billion kilometers from Planet Earth, making it the farthest ever spacecraft to successfully take images and beam them back to us. The images reveal a large object deep inside the Kuiper Belt that could potentially be a full-sized rocky planet. Thales has been the undisputed world leader in RF technologies since the dawn of the Space Age, and today it continues to have an impact on the discovery of the farthest reaches of the solar system. The photographs taken during New Horizons’ routine calibration, surpass even those taken by the legendary Voyager 1 spacecraft, that sent us a now iconic image of Earth taken from 6.06 billion kilometers away. But beyond the sheer scale of this record that Thales helped to achieve, is the potential for scientific discovery. Ever since Pluto was reclassified from a planet to a dwarf planet in 2006, the scientific community has been speculating on the composition of Kuiper Belt objects. Scientists are especially excited by the prospect of finding the so-called Planet 9, a hypothesized world beyond the plutonian orbit – about 75 times farther than Pluto’s distance from the Sun – deep inside the Kuiper Belt. The objects’ existence could shed more light on the formation and early composition of the Solar System and significantly advance our understanding of orbital mechanics and planetary formation. Could one of these objects be the 9th planet? Our brave little explorer New Horizons might just give us the answer soon, with a little help from Thales. The incredible keeps on coming. Thales technologies were there to record Neil Armstrong’s first steps on the Moon, are there to help map out the furthest reaches of the cosmos, and will be there when machines once again roam the surface of Mars. How to achieve such a performance? Sending a picture of something this distant is only possible with Thales traveling wave tubes and amplifiers. The New Horizons LORRI CCD monochromatic camera (1024×1024 pixels) delivers a 12-bit digital signal. To be transmitted from a satellite to Earth, images like any other digital data (command and control of the satellite for example) are then transformed into a modulated baseband analog signal, which is carried by a microwave signal (X-band in this case). This X-band signal is amplified by the TWTA and then radiated toward Earth through a large antenna dish. Because of the huge satellite-Earth distance, the received signal on Earth is very weak, limiting the transmit data rate to approximately 1 kbit. X-band on-board amplifiers are using TWT (Traveling Wave Tubes) supplied by Thales, 15W each in a dual configuration (amplifiers are also redundant, to have a backup in case of problem). Find us on Twitter @ThalesAerospace, on our official Youtube channel Thales Aerospace and on LinkedIn Thales Aerospace. 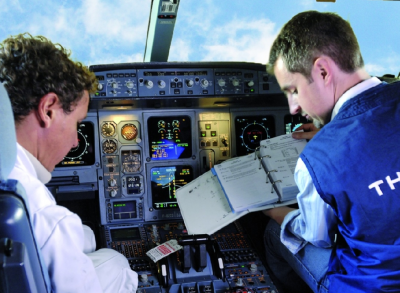 What is the impact of Big Data on the aeronautical industry? 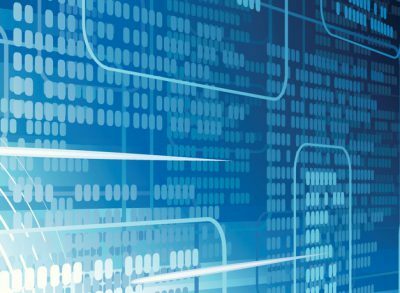 Digital Lab opens its doors within Thales's Customer Support Center in Châtellerault! 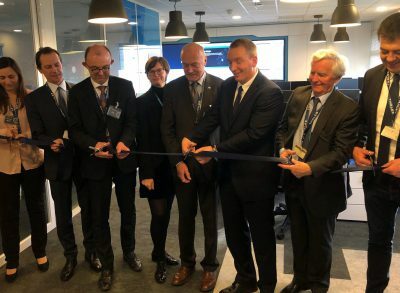 On Monday January 20 2019, the Customer Support Center in Châtellerault, central France, held a well-attended event to officially inaugurate its Digital Lab.